MPAA Rating: R for for violence, sexuality and language. People are always throwing around clichés like nickels, and these people tend to drive me as near insane as punsters (back when I smoked and my Nana was alive she'd always tell me I was making an ash of myself.) I think people like me grow to hate clichés during our teenage years, when every lesson learned is moralized to us via cliché. "Haste makes waste." "The early bird catches the worm." Yada, yada, yada. The fact of the matter is however, that clichés (unlike puns) usually serve a valid and utile purpose. When I first saw A Stir of Echoes in the theater, I enjoyed it, but I thought it missed the mark. So, not expecting much, and with some thought of giving away the DVD to one of the other dOc reviewers, I plopped it in the player. Wow! Artisan really went all out with this disc, from the fantastic menus to the excellent image transfer, but especially the tremendous DD5.1 soundtrack (more on these later). I was captivated, I was glued to my seat. I still feel slightly short-changed by the ending, but how often do endings live up to the level of the rest of a great book or film? Not often. 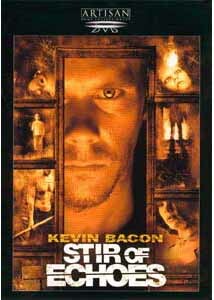 A Stir of Echoes tells the story of Tom Wyski (Kevin Bacon), non-believer and cynic, who is hypnotized at a party by his sister-in-law (Douglass), after which all hell breaks loose in his head. He begins to see visions―bits and pieces of information jumbled into a mysterious puzzle. The sound makes this film, crashing, splashing, rolling in waves of fury and pain and doom in an overwhelming orchestration of tension. Borrowing from Hitchcock, Koepp uses flashes of red to inject clarity into a world of confusion, as Wyski eyes become opened to a subliminal reality that slices through the external chaos.Tom's visions begin to presage events, and this is when Tom begins to lose power, rather than gain as you might think. His boy has the power as well, which leaves mom, Maggie (Katherine Erbe), out in the supernatural cold. As Tom begins to put the enigmatic pieces of the images he is receiving together, his deepened sense of reality begins to form a chasm between his wife and he. Feeling that his life has been "slowly sucked in to stasis and mediocrity," as director David Koepp puts it, the unveiling of the mystery outweighs his work, his friendships, his house, his marriage, and perhaps his sanity. All of the acting is fine in this film, but this may be Kevin Bacon's finest performance, personifying a man on the brink. I was so enthralled with this film upon my second viewing, and I think directly due to the clarity of the image and envelopment and placement of the sound on this disc, I can't help myself from revealing that A Stir of Echoes was better the second time around. Image Transfer Review: This is an exceptionally clean print, as one might expect from a new film. Other than a bit of orange-hued skin color, the color is well saturated, clean and bright throughout. Which is important for a film that uses color as adeptly as this one. The image is crisp and with little hint of artifact. Again, perhaps Artisans best transfer to date. Audio Transfer Review: It's a rarity when Artisan puts out a DD5.1 track, and they have put together a doozy. It rises from the fronts and spreads to the rears with a creepiness underlining the film's tone. The bass booms out in moments of heart pounding anxiety making me unnerved in a way I failed to experience in the theater. The razors of sound cut across the air sharply—almost mystically, sweeping left to right and back. This is in the top 5 DD5.1 soundtracks this reviewer has heard yet, using the soundstage the way discrete channeling was meant. Bravo, Artisan! Extras Review: As with the Blair Witch, Artisan has created a very unique menu, with a combination of film clips, animation, music and eerie sounds to make a creepy creation...although it irritates me seeing so many shots within the menu (but not nearly as bad as the Blair Witch which show parts of the ending scene)...what if I hadn't seen the movie in the theater? The best aspect of the extras is by and far the director's commentary. David Koepps is interesting, and his love for the film and the making of it are illustrated through out. He divulges many secrets of the films unusual effects, as well as illuminating us how they made a college student stick a pin through his hand twice, but used the first take anyway! Or what they used to create the uttely painful, spinetingling sound of the "ail" shot. Yikes! Behind the scenes takes you to the shooting of the film strung together in a strange and slightly aggitating mannerStill, with these, the trailer and TV spots, and very entertaining and informative director's commentary, a very good extras compilation. All in all a highly entertaining film, that will leave you with chills thinking back upon it. I am also prepared to claim this as Artisan's best disc to date, with fantastic sound and image, surpassing even the Blair Witch Project and eking passed Suicide Kings.